When a business has property damage due to floodwater, commercial flood insurance can cover the costs of recovering the building and its contents. Since floodwater damage is seldom covered by other types of commercial insurance, a business will often need a separate flood insurance policy. At King Insurance, we offer commercial flood insurance in addition to other business insurance coverage. Commercial flood insurance protects a commercial building and its contents in case of floodwater damage. Areas of the building covered by flood insurance include the walls, roof, ceilings, floors, and interior fixtures. Items inside the building such as furniture, computers, or personal possessions; as well as commercial assets such as product inventory or machinery are likewise covered. Usually, a flood insurance policy won’t cover damage to business vehicles, which requires a separate commercial vehicle insurance policy, nor will it cover lost revenues caused by an interruption to business operations. Coverage can extend to property damage caused by mold or mildew, although a flood insurance agent or claims adjuster will determine eligibility in these cases individually. 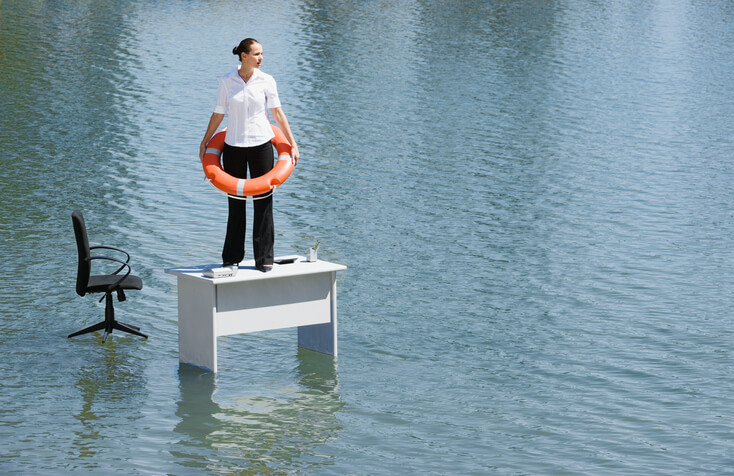 A business is wise to have a flood insurance policy. Not only can floodwater damage hamper a company financially, but the risks of flooding can arise suddenly and sometimes from unexpected causes. Nine of 10 natural disasters involve flooding, which means any business that’s situated where severe weather phenomena, such as hurricane storm surges, occur should consider flood insurance. But even when properties aren’t located in obviously flood-prone areas, there can still be risks of flooding from other causes. Leaves or debris collecting in front of a storm drain, for example, can block the drainage of rain or melting snow and cause flooding for a business. A single instance of flooding can create sufficient property damage to hinder or destabilize a business of any size financially. To a small business, the unplanned cost of replacing a building’s entire electrical or plumbing system due to floodwater damage, for example, could jeopardize the business financially. But even larger companies could struggle with compensating financially for the extensive damage flooding can cause to commercial infrastructure. When floodwater causes damage to the building or assets of a business, commercial flood insurance will compensate for the cost of those damages. Depending on the policy, the amount of coverage can be up to one-half million dollars. Per law, a business must purchase its flood insurance policy at least 30 days prior to filing an insurance claim. Especially following severe flooding, the damages caused by floodwater can be quite evident, such as demolished walls or collapsed ceilings in a commercial building. But even minor flooding events can manifest extensive and costly damages to the electrical, HVAC, or plumbing systems in a building. In fact, the potential financial costs of floodwater damage are so severe that some businesses, including those that have certain types of mortgages or property in high-risk flood areas, are legally required to have commercial flood insurance. Options for flood insurance are available from the National Flood Insurance Program (NFIP), which is part of the Federal Emergency Management Administration (FEMA), but the actual flood insurance policy must be obtained from an approved flood insurance specialist, including King Insurance. While there are similarities between flood insurance and property insurance, the coverages usually don’t overlap which makes having both of these types of coverage necessary for businesses. Similar to flood insurance, property insurance covers the cost of property damage to a business, but the causes of those damages include minor accidents or disasters, such as lightning or wind damage. While some property insurance policies cover certain types of water damage, floodwater damage is not included. Thus, a business should consider having both flood insurance and property insurance for complete coverage. For example, damage to a commercial building caused by hurricane winds would be covered by property insurance, while damage caused by floodwater due to the hurricane’s storm surge would be covered by flood insurance. King Insurance offers commercial flood insurance policies with coverage levels that are right for businesses of different sizes. Choosing a policy starts with a discussion between you and a King Insurance agent about whether your business needs flood insurance, although, considering the variety of flooding risks, some form of coverage is recommended for most business. Your King Insurance agent will then determine the level of coverage your business needs based on the value of your building and its contents; having a preliminary list of your assets can facilitate this process. In the end, you’ll receive an individualized flood insurance policy that adequately protects your business from the potential risks of floodwater damage. Commercial flood insurance is but one of many business insurance options offered by King Insurance. From business owners policies (BOP) to commercial auto insurance, as well as workers’ compensation, surety bonds, and other commercial insurance coverages, King Insurance agents have coverage plans for businesses of all sizes and industries. In consultation with a King Insurance agent, you can receive a customize insurance portfolio that fully covers your business from financial risks. Contact us to learn more about our business insurance options.